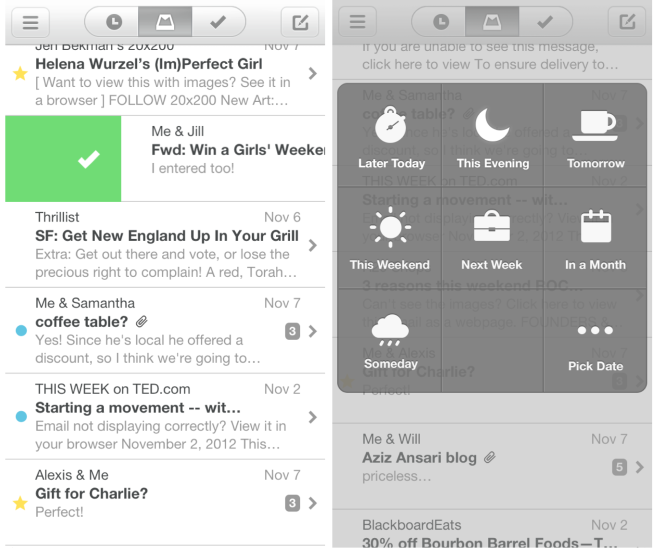 Email is an old medium that Orchestra has decided to overhaul in their new iPhone App, Mailbox. Using intuitive hand gestures, you can quickly go through your email by just swiping across the screen. A quick swipe to the right archives your message while a longer slide deletes your message. Scan an email chain quickly with a conversation like view or snooze an email with a tap of a button. The snooze feature allows you to take care of an email at a later time with options for later that day, tomorrow, or even the weekend. When you have checked all your email for the time being, it will leave your screen empty, creaing a clean and zero inbox. Due to the high demand however, there is currently a reservation system in place which queues you behind other users who have requested an invite. The app is available now on the App Store for free.